I don't remember how I found out about Uncle Clay's House of Pure Aloha. I just knew I wanted to try their shaved ice. We marked the location on our map and despite a few turnarounds and a few SP sighs of frustration, we found it (and the La Tour Cafe, where we ate lunch). Snow cone, Italian ice, Hawaiian ice, I don't know the difference but I do know that Uncle Clay's shaved ice is by far my favorite ice treat. There are lots of flavors, toppings, too, and ordering was a bit overwhelming. We were newbies and everyone else seemed to know exactly what to get and how to order. It was sort of like how I feel when I'm in a coffeeshop trying to order a coffee drink - latte/cappuccino/Americano/cortado/macchiato - what the heck is the difference and why can't it just be small-medium-large? We settled on guava and mango. It was so good. Really good. 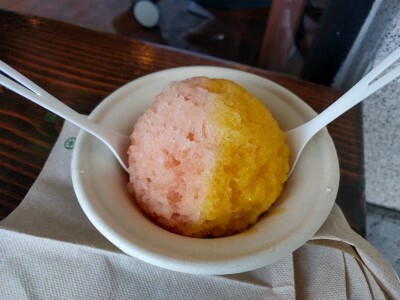 The shaved ice was like light, fluffy snow. One vacation regret: we didn't make it back. But this will be the benchmark against which I measure all future shaved ice treats.